Before you start, be sure you have a tape measure, a note pad and a pen. It is important that you setup your WDS on your vehicle and trailer when they are laden with fuel and luggage. You may find it useful to print the BEFORE and AFTER diagrams and record your measurements when setting up your Weight Distribution System. This will be useful later for a quick and handy reference. Set the tow vehicle and trailer on firm and level ground, a quiet car park is ideal. Using your jockey wheel to level the trailer, measure the distance between the caravan and the ground, front and rear, and record (Before C & D). Measure the distance between the ground and the top of the wheel arches on one side of your tow vehicle, front and rear, and record (Before A & B). Make any adjustments to the towball height (if equipped) to ensure your trailer’s coupling is aligned with the towball. This can be done by rotating your towbar’s TBM (Mini or Intermediate WDS), or adjusting the ball mount of the WDS as shown under the Weight Distribution System Kits tab (Medium, Heavy and Super Heavy Duty). Hitch your trailer onto your towball and release the jockey wheel from the caravan’s A-frame. You will now see the suspension geometry of your tow vehicle change and notice the rear section compress whilst the front of the tow vehicle will rise. Now measure the wheel arches as done in step 3 and record (After A, B, C & D). Setup Weight Distribution System as per instructions included with the kit or download new details from the Hayman Reese website. Lift spring bars and adjust into position, using retaining pins where applicable to lock the hitch into position. 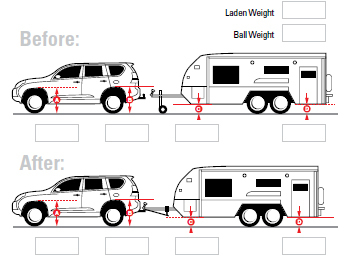 Measure the change in suspension height on the front and rear of the tow vehicle as done in steps 3 and 6. Adjust tension on the spring bars by increasing or reducing the number of chain links between the end of the bars and the snap up brackets. Re-take measurements and ensure you have rebalanced the difference between the front and rear wheel arch taken in step 6 (within a 10mm difference). If you have observed an increase in the suspension height at the rear of the tow vehicle, you have re-distributed too much weight forward. You may need to experiment by adjusting the amount of tension. Keep these records in a safe place for easy recall and regularly inspect your tow vehicle height throughout your journey. Your caravan’s laden weight may vary during your journey and it is important that you make these changes to ensure your WDS is setup correctly to ensure optimum stability.